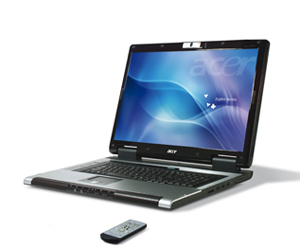 If you want the biggest, easiest-to-view notebook screen, the $2999 (as of April 11, 2007) Acer 9810-6829 is the obvious choice. You may also want to peel off a few more bucks to fetch a wireless keyboard and mouse. But if you already have trouble fitting a laptop on your cluttered desk, you may need to start by replacing your desk. It's not until you see the Acer Aspire 9810-6994 in person that you realize just how big it is. It looks like a stage prop-an everyday item up-sized for the audience members way in the back. But it's real, all 17 hulking pounds of it. Clearly, it was not designed as a portable PC but rather as a desktop computer that folds away and perhaps gets taken to a weekend house as the entertainment center.